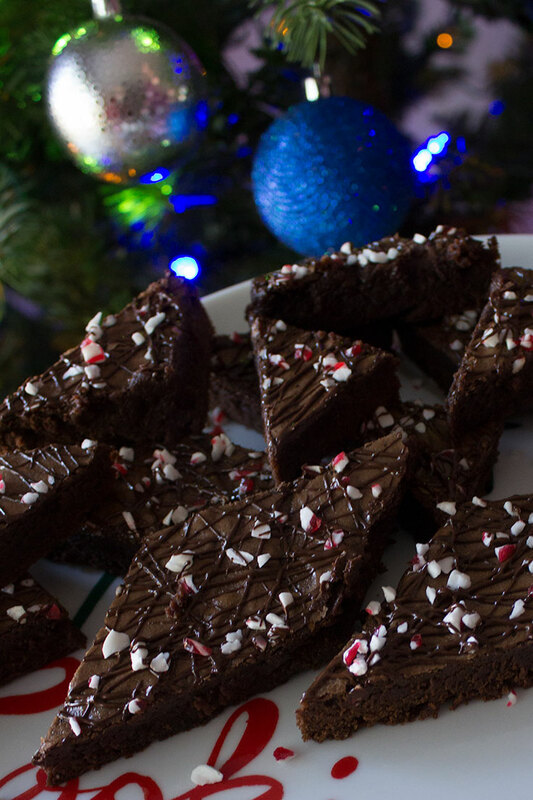 These dark chocolate peppermint brownies are best the day after they are baked—making them the perfect festive make-ahead dessert for the festive season. The peppermint brownie recipe that I’m sharing with you today has a special twist: peppermint mocha Kahlua! If you don’t have it, you can use peppermint schnapps, peppermint vodka, or just plain peppermint extract. They’re even better the day after being baked, which I know is just a tease, but trust me: let them sit around for a day and they’ll be spectacular! When I make these, I usually have to make two batches because my husband will steal as many brownies as he can once they’re out of the oven. (When I’m taking these to a party, I usually have to stash them in the trunk because he’ll eat half of them on the drive to wherever we’re going.) They’re pretty delicious on the first day, so if you’ve come across this recipe the day you plan to serve them, that’s okay, too. If you're serving these for Christmas, serve each brownie with a generous spoonful of your favorite peppermint bark ice cream! This December, our holiday party schedule is a bit light, and to be honest, I’m thankful for it. Other than a couple of wine-related holiday parties and my first attempt at cooking an entire Hanukkah dinner for my husband and his family, we haven’t accepted any other party invitations. It’s not that I don’t enjoy this time of year, because I truly enjoy the process of selecting a dish to bring along and wear a hideously awesome Christmas sweater (this year I have a sweater dress—and it lights up!). But this year, just like last year, my family and I are missing some really amazing people and their loss just changes things... but who knows, perhaps I’ll put on my ugly sweater dress and my entire outlook will change. 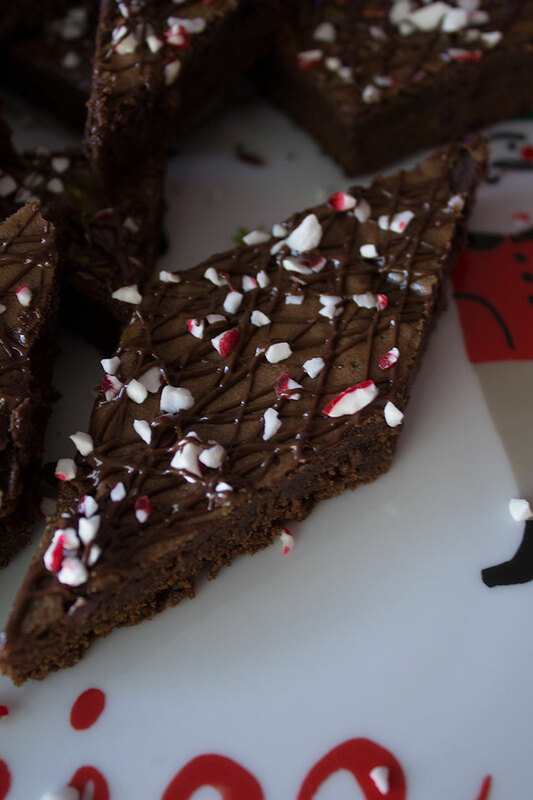 When I most recently baked these dark chocolate peppermint brownies, it was seriously freezing in the house. When it’s 20 degrees in California, life is tough! So tough that I might have added some of the peppermint mocha Kahlua to my morning cup of joe while I was putting these brownies together. If it’s still available, I can not recommend Kauai Coffee’s Chocolate Mistle Toe enough. Add a little splash of that peppermint mocha Kahlua and the frigid temperatures doesn’t seem like such a big deal any longer! I make this dessert every Christmas. These brownies are best a day after baking them. Preheat oven to 300º and generously grease a 9x13 baking dish. In a small microwave-safe bowl, melt the chocolate and the butter, stirring until no large chunks of chocolate remain. Set aside to cool slightly.In a large bowl, whisk together the eggs, sugar, peppermint mocha Kahlua and vanilla extract until combined. Add the melted chocolate mixture. Set aside.In a medium bowl, sift together the flour, baking powder, and salt. Gently fold into the chocolate and egg mixture until combined. Pour into prepared baking dish and bake until done about 23 minutes. Let cool to room temperature.In a microwave-safe bowl, melt the chocolate. Pour the melted chocolate into a pastry bag fitted with a fine tip, I use the 3rd smallest one in my kit. Carefully drizzle half the chocolate over the brownies. Sprinkle the peppermint pieces over the brownies. Drizzle the remaining chocolate over the peppermint pieces. Allow the chocolate to set, then cut into diamond-shaped pieces. Which desserts do you find yourself making for the holidays?